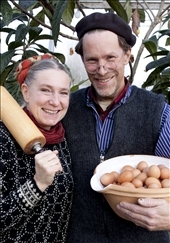 Gustav and Marie Mandelmann have been running their farm Mandelmann’s Gardens since 1966, with vegetable as well as livestock farming, in the little village of Rörum on Österlen in southern Sweden. On the 60 hectares large grounds they have created a meeting place for all ages with a garden kitchen, a farm shop, open gardens and a greenhouse. Since 2017, they have been featured on the popular and award-winning TV show ‘Mandelmann’s farm’ showing their life and work at the farm.